This list includes all aircraft carriers and major surface combatants: cruisers, destroyers, and frigates. Note: Propulsion and speed data for nuclear-powered ships are not released by the US Navy. The data provided herein is based on the typical unofficial estimates. Specifications unknown - evolved from Nimitz Class. Concept/Program: CVNX is a new carrier design intended to follow the Nimitz class in production. The design will be gradually evolved from the existing Nimitz design, rather than starting with a completely "clean sheet". Details are not yet determined, but the ships will feature much lower manning, new electronic systems, electromagnetic catapults, and a new propulsion plant. CVN 77, the final Nimitz class ship, will be a "transition" ship, and will include some of the CVNX technology. Builders: Northrop Grumman Newport News, VA.
Concept/Program: USN's primary carrier class. The Nimitz class is considered the finest carrier design ever; the ships will be in production for over 30 years, and the last will be in service up to 80 years after the first was completed. CVN 77, the final ship of this class, will be a "transition" ship to the new CVNX design, and will differ considerably from the other ships of the class. Although some references consider CVN 71-76 as a separate class from CVN 68-70, progressive overhauls and modernization have eliminated many of the differences. Builders: Newport News SB&DD/Northrop Grumman Newport News, VA.
Design: Based on previous USN carrier classes, but with general improvements throughout. There have been progressive modifications throughout the history of the class; each ship is more modern than the previous vessel. There are many detail variations among the ships. CVN 76 will have a bulbous bow and a significantly modified island - the island will be one deck lower than in previous ships, and will carry all the ship's radars; the separate radar mast abaft the island will be eliminated. Modernization: Starting with Nimitz, each ship will undergo a RCOH refueling and overhaul, and will be brought up to the standards of the latest ships. The Nimitz RCOH included complete electronics modernization, complete removal and reconstruction of the upper two levels of the island, and significant rearrangement of radars, similar to the CVN 76 configuration. Eisenhower is now undergoing a similar overhaul. Concept/Program: Last non-nuclear USN carrier to be constructed. After a COH overhaul completed in 1995, this ship was designated as the "reserve/training" carrier, and was assigned to the Naval Reserve Force, but has always been fully operational and has deployed in the same rotation as the other carriers. The "reserve/training" designation has been abandoned. Scheduled to serve through approximately 2018; likely to be based in Japan after 2008. Builders: Newport News SB&DD, VA.
Design: Based on Kitty Hawk class, but with various improvements. Is distinguished by an angled funnel, designed to carry exhaust gasses away from the flight deck. Modernization: Underwent a major COH reconstruction at Philadelphia in 1993-1995. Is planned to receive two 21-cell RAM launchers. Concept/Program: The first nuclear carrier, and the world's longest warship. Recently modernized for extended service. Scheduled to be replaced by CVNX 1 in 2013. Design: Based on previous US carriers, but adapted for nuclear power with 8 submarine-type reactors. Featured an unusual square island supporting large phased-array radars and an electronic warfare array; the radars and electronics have been removed, but the ususual island remains. Modernization: Underwent a major reconstruction in 1979-1982, including replacement of radars and electronics. A RCOH modernization, life extension, and refuelling was carried out in 1990-1995. 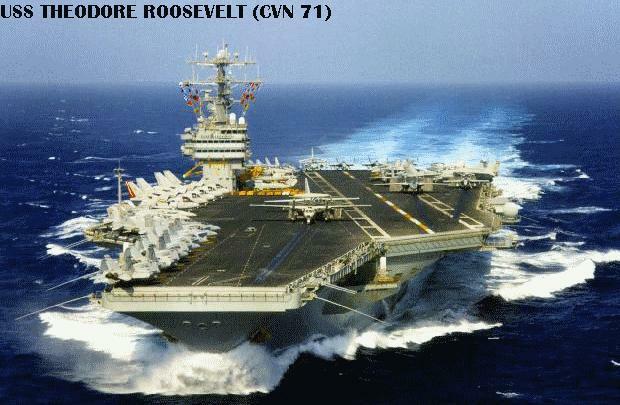 Concept/Program: USN's second supercarrier class, based on the previous Forrestal class. A third sister, America (CV 66]) has been discarded. 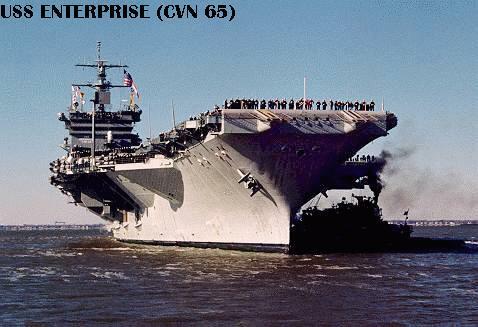 Both ships have been modernized under SLEP, and are expected to remain in service for several more years - they will be decommissioned in 2008 and 2003, respectively; their replacements will be CVN 76 and CVN 77. CV 63 is forward-deployed to Yokosuka, Japan. 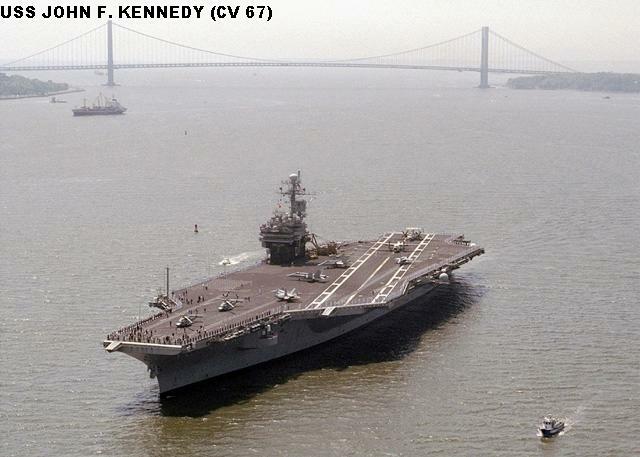 Builders: CV 63 by New York SB, Camden, NJ; CV 64 by New York Naval Shipyard. Design: Based on Forrestal class but with major improvements througout the ship. The arrangement of elevators and the island position were changed; the ships were built with defensive missile batteries instead of guns. Modernization: Both underwent SLEP at Philadelphia in the early 1990's, receiving general updates and life-extension work. 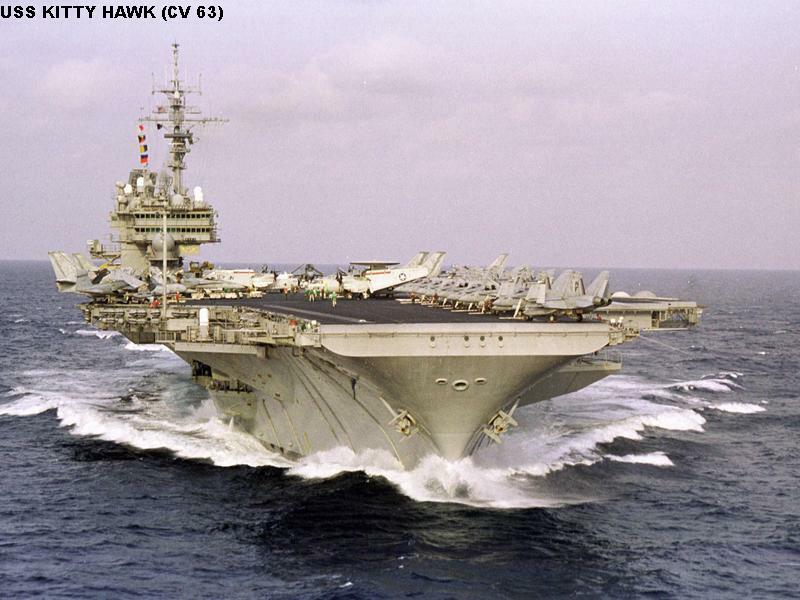 Kitty Hawk had a major yard period in 1998, in preparation for forward deployment to Japan. Disposal Note: Of the Forrestal class ships, Forrestal and Saratoga have been stricken and are stored at Newport, RI, pending disposal. Ranger and Independence are in reserve at Bremerton, WA. All Midway and Essex class ships have been stricken; Midway is at Bremerton, WA; Oriskany is at Beaumont, TX, both pending disposal; all others are museums or have been scrapped. Concept/Program: USN has formally identified the CG(X) program as a new-design replacement cruiser, a variant of the DD(X) "family" of ships. CG(X) formalizes the long-anticipated CG-21 program, which had been expected as a derivative of the SC-21/DD-21 design. Design and construction of these ship is many years away; the first Ticonderoga class cruiser will be due for replacement in about a decade. Fire Control: Aegis AAW system; 4 Mk 99 SM-2 guidance systems with SPG-62 radars; CEC in CG 66, 68, 69, 71. Armament: 2 61-cell Mk41 VLS (122 Standard SM-2, VLA and Tomahawk), 8 Harpoon SSM, 2 5"/54cal DP, 2 20mm Phalanx CIWS, 2 triple 12.75 inch torpedo tubes (Mk46 torpedoes), 2 25mm Bushmaster low-angle in most, 2-4 12.7mm MG.
Concept/Program: USN's primary area-air-defense ships, these are highly-capable area AAW ships, fitted with the SPY-1 Aegis system and VLS missile launchers. They are also highly capable in ASW, strike and anti-surface warfare, and will soon be equipped for ballistic missile defense duties. These ships are unofficially separated from the first 5 units of the class, which have major weapons differences (see below). It is reported that most of the SQR-19 towed arrays have been placed in storage ashore. Builders: Litton/Ingalls SB, Pascagoula, MS (lead) and Bath Iron Works, Maine; CG 51, 58, 60, 61, 63, 64, 67, 70 by BIW; others by Ingalls. 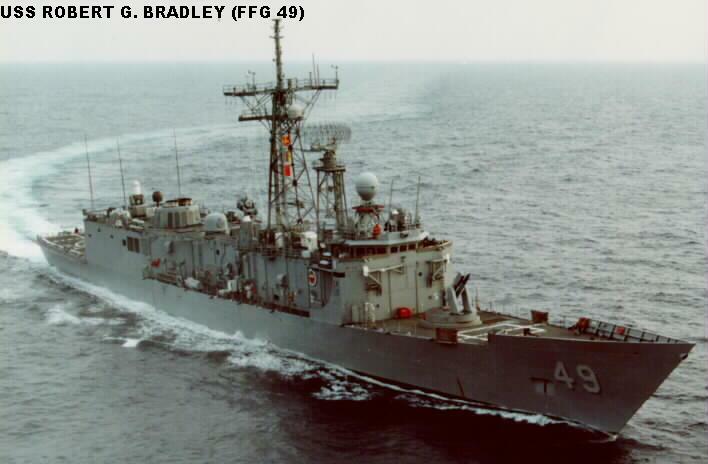 Design: Spruance-class hull with extensive modifications to accommodate the Aegis system. Weight problems have been partially resolved, but these ships are at the upper limits of the hull's capabilities. There are extensive differences among these ships, particularly with regard to combat systems (AEGIS) equipment. Modernization: Some incremental updates have taken place, particularly in the AEGIS system; all ships underwent major overhauls in 1997-2000. Some hull stiffening has been carried out to correct potential cracking problems. A major upgrade/life extension, the Cruiser Conversion Program (CCP), is in the planning stages. This project would extend the life of these ships to 40 years, allowing the oldest units to serve until 2020. CCP probably will include AEGIS upgrades (bringing all ships to a common baseline), removal of the VLS reload cranes (providing 6 additional VLS cells), replacement of CIWS by ESSM, addition of Cooperative Engagement Capability (CEC), new EW systems and decoys, and maintenance/manning-reduction improvements. Some ships will receive Navy Theater Wide ballistic missile defense systems, while other will receive less comprehensive ballistic missile defense systems. Armament: 2 Mk26 twin-arm missile launchers (88 Standard SM-2), 8 Harpoon SSM, 2 5"/54cal DP, 2 20mm Phalanx CIWS, 2 triple 12.75 inch torpedo tubes (Mk46 torpedoes), 2-4 12.7mm MG.
Concept/Program: The first five ships of this class have a less-capable weapons and sensors package, although they still are highly-capable area AAW, ASW and ASuW ships. The primary limitations of these ships are Mk26 launchers rather than VLS (preventing the use of Tomahawks), and an early version of the SPY-1 system; two of these ships also lack complete helicopter facilities. The three Atlantic Fleet units are employed primarily in home-waters operations and patrol duties, but the Pacific Fleet ships continue to deploy. Builders: Litton/Ingalls SB, Pascagoula, MS except CG 51 by Bath Iron Works, Maine. 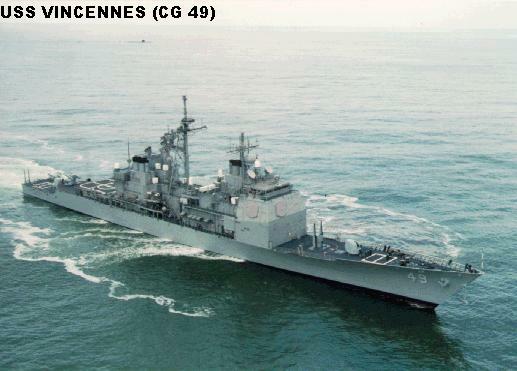 Design: Spruance-class hull with extensive modifications to accommodate the Aegis system. There are a number of differences between these ships, reflecting weight reduction efforts and equipment that was never fitted in the lead ships. CG 47 and CG 48 have heavier masts than the others. Modernization: There have been some modest upgrades, and all ships underwent major overhauls in 1996-99. Yorktown is employed as a test ship for "Smart Ship" automation and manning-reduction programs. These ships may be included in the Cruiser Conversion Program (see above), or they may be decommissioned in the near future. Disposal Note: All CGNs have been decommissioned and stripped for eventual scrapping, the last in 1998; all Leahy and Belknap class CGs were discarded by the end of 1995. Concept/Program: Effective 1 November 2001 the DD-21 "land attack destroyer" program became the DD(X) program, a "family" of advanced surface combatants. It is anticipated that DD(X) will be a ship similar to the DD-21 concept, and derived from the existing DD-21 designs, but somewhat smaller. The number of ships to be built is uncertain. There will be CG(X) and "Littoral Combat Ship" variants of the design. Builders: Northrop Grumman Ship Systems, Pascagoula, MS and Bath Iron Works, Maine. NGSS is the lead yard for the current phase of ship design; future construction will be shared by the two yards. Design: Previously published DD-21 specifications are no longer applicable to DD(X). The new program will carry forward the major DD-21 design elements such as electric drive, SPY-3 (ex-MFR) radar, and the Advanced Gun System. Armament: 1 32 cell Mk41 VLS, 1 64 cell Mk41 VLS (96 Standard SM-2, Tomahawk, VLA), 1 5"/62cal DP (5"/54cal DP in DDG 79-80), 2 20mm Phalanx CIWS (DDG 79-84 only), 2 triple 12.75 inch torpedo tubes (Mk46 torpedoes), 2 25mm Bushmaster low-angle (most ships), 4 12.7mm MG.
Concept/Program: Improved Burke class ships, incorporating a number of additional systems, modernizations, and upgrades. These ships could be considered an entirely separate class, due to the extensive changes included in the Flight IIA upgrade. They will be the mainstay of the surface fleet in the early decades of the next century. 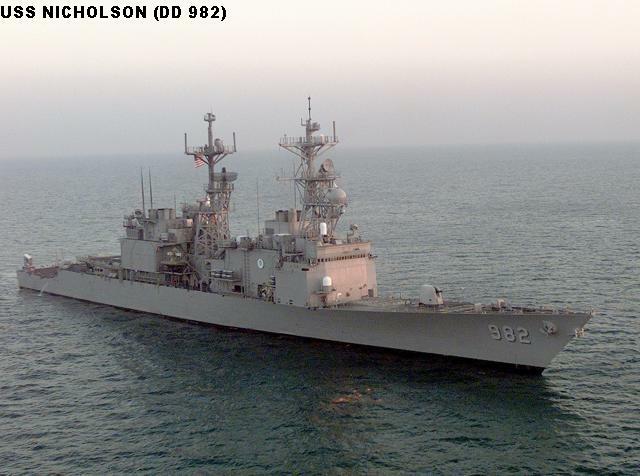 DDG 89-101 were ordered in 1998 under a Multi Year Procurement (MYP), covering 1998-2001; this resulted in significant savings. 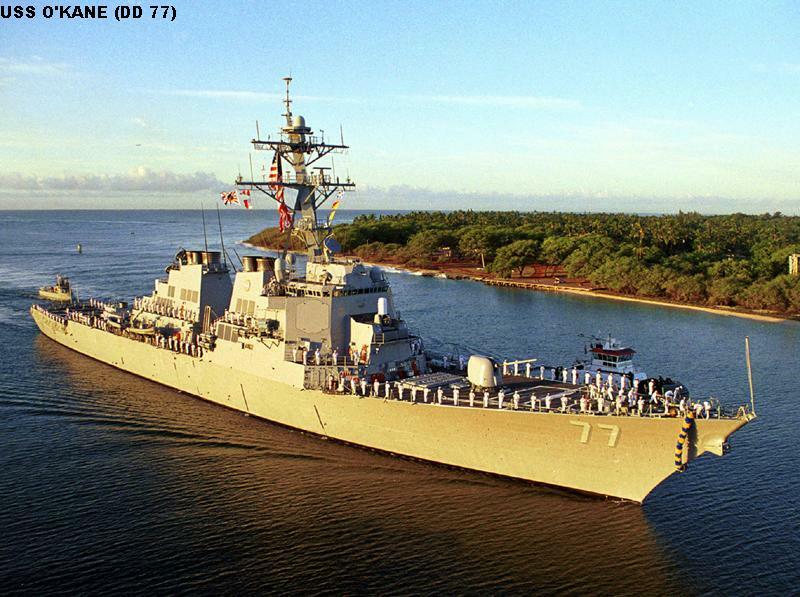 DDG 102-112 were ordered under the 2002 program, although DDG 102 will be built to the 1998 design. The exact number of ships to be built is uncertain, and additional ships may be added beyond the current construction plan. Builders: Bath Iron Works, Maine (lead) and Northrop Grumman Ship Systems/Litton-Ingalls, Pascagoula, MS.
Design: The major change from Flight II to Flight IIA was the addition of dual helo hangars and full aviation support facilities. This required lengthening the hull by 5' at the stern, significant internal changes to accommodate RAST, and raising the aft VLS by one deck, with hangars placed on either side of it. Additional berthing has been added to accommodate the helicopter crews. A much larger torpedo/missile/rocket magazine is provided to store helicopter-launched weapons, and maintenance shops have been added. The aft SPY-1D panels are raised by one deck level, and the reload cranes have been eliminated from the VLS, resulting in 6 additional VLS cells. New-design propeller blades are fitted, and the transom is modified to improve fuel efficiency. The entire electrical system has been completely redesigned for greater survivability. Phalanx CIWS has been deleted from DDG 85+, in anticipation of the Evolved Sea Sparrow Missile (ESSM) being available as a self-defense weapon. SQR-19 TACTAS and Harpoon SSMs have been deleted, but could be re-installed if necessary, given sufficient advance notice. These ships also have a number of enhanced automation, survivability, and crew-reduction measures. DDG 81+ are fitted with the new 5"/62cal gun and revised magazine arrangements to allow storage of ERGM rounds. Retrofit of this gun to previous ships has been proposed, but may not be practical. Armament: 1 29 cell Mk41 VLS, 1 61 cell Mk41 VLS (90 Standard SM-2, Tomahawk, VLA), 1 5"/54cal DP, 2 20mm Phalanx CIWS, 2 triple 12.75 inch torpedo tubes (Mk46 torpedoes), 2 25mm Bushmaster low-angle (most ships), 4 12.7mm MG.
Concept/Program: These ships, the first all-new US Navy surface combatant design in many years, are fully multirole ships. Their primary emphasis is AAW, but they are very capable in all other warfare areas. They were designed with "lessons learned" from previous classes, and are among the finest surface combatants in the world. The Flight IIA variant of this class is listed separately (above). It is reported that most of the SQR-19 towed arrays have been placed in storage ashore. 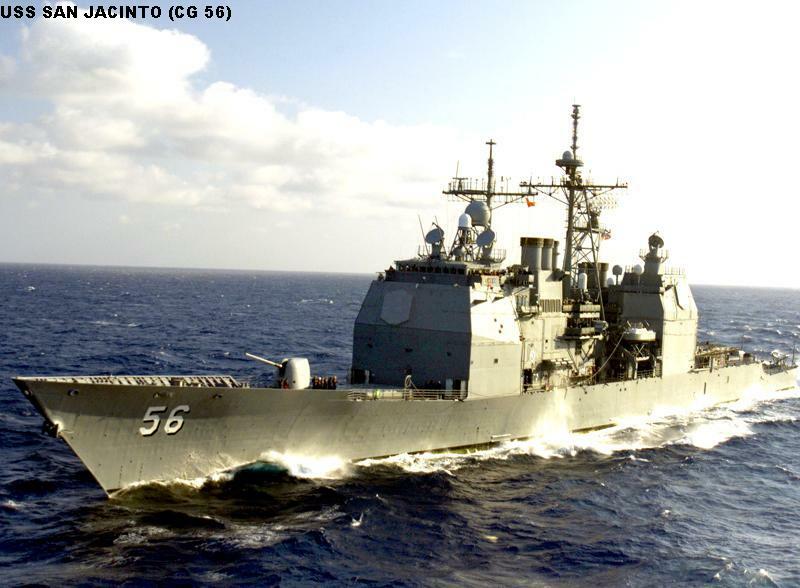 Cole (DDG 67) was attacked by suicide bombers 12 October 2000 and was repaired at Ingalls. Builders: Bath Iron Works, Maine (lead) and Litton/Ingalls, Pascagoula, MS.
Design: The design emphasizes seakeeping, stealth, and survivability. Their construction is all-steel (except the aluminum mast), and they have some passive protection systems; they are provided with a collective protection system to protect against CBR attack. Their seakeeping is excellent, and they can maintain high speed in heavy weather. There has been a significant effort to reduce radar cross section. Although there is no helo hangar, they can land, refuel, and re-arm helos, and are fully outfitted with the LAMPS III system datalinks and processors, so they can operate with another ship's LAMPS helo. The SPY-1D system in these ships is considerably more modern than the SPY-1A/B in the Ticonderoga class, but there are only 3 missile directors, rather than 4. The differences between Flight I (DDG 52-71) and Flight II (DDG 72-78) are minimal. Contrary to some reports, SLQ-32(V)3 is fitted starting in DDG 68, not DDG 72; SLQ-32(V)5 "Sidekick" has not been retrofit in these ships. DDG 51 lacks some features included in the later ships, notably helo fueling and arming facilities. Concept/Program: Built as large ASW destroyers for service with carrier groups, these ships have evolved into multi-mission combatants. There have been a number of modernizations and upgrades, resulting in significant variations in configuration and capabilities. The seven ships of this type which were not fitted with VLS have been decommissioned; decommissioning of VLS-equipped ships started in 2001. USN had planned to keep some of these ships in service at least through 2014, but recent changes to the fleet plan will retire all these ships by 2007. Builders: Litton/Ingalls SB, Pascagoula, MS.
Design: An all-new design, breaking from all previous USN design practices. First USN warships with gas turbine propulsion. The design provided considerable growth margins, and progressive upgrades were intended from the outset. The basic hull has been adapted for several other classes. All ships underwent major overhauls 1995-2000. DD 968 has a large composite enclosure around her mainmast; this is a trial installation for composite mast systems, which are planned for future classes. Disposal Note: The Kidd class destroyers have been stricken and are awaiting disposal; they may be sold abroad. All Adams and Farragut class DDGs and Sherman class DDs have been stricken, and most have been disposed of. Concept/Program: The Littoral Combat Ship (LCS) is a fast-track program to develop a new, small, high-speed combatant for coastal operations. The concept is being developed from the HSV-X1 high-speed catamaran, and is an outgrowth of the earlier, smaller "Streetfighter" concept. It is planned that the vessel could rapidly switch equipment for a variety of missions, such as coastal ASW, minesweeping, patrol/interdiction, or perhaps logistics. In this way the ship could perform a variety of missions, without carrying all the equipment for all the missions simultaneously. Up to 60 ships are planned, and the Navy hopes to begin construction within 2 years. Six design teams submitted concepts under the initial design study, known as the Focused-Mission High Speed Ship; of these, 3 will be selected for further development under LCS Phase I contracts. The initial 6 designs included 1 trimaran (illustrated here), 2 catamarans, 1 monohull, and 2 SES/hovercraft-type vessels. It seems likely the selected design will be a displacement hull (mono-, cat-, or tri-hull), in the range of 2,500 to 3,000 tons displacement. The ship is, in effect, a small frigate-type vessel. Fire Control: Mk 13 weapons direction system with Mk 92 and SPG-60/STIR SM-1 guidance systems; CORT/SYS-2(V)2 combat system in FFG 36, 47, 48, 50-55, 57, 59, 61. Concept/Program: Built as low-cost convoy escorts, these vessels are filling battlegroup and patrol roles in the post-Cold War era. They have basic capabilities in most warfare areas, but have no strike or fire support capability. Ships of this group have lengthened hulls to accommodate RAST and SH-60B helicopters; some units also have more advanced combat systems. The "short hull" ships are listed separately (below); they are being discarded. The "long hull" ships will remain in service for the forseeable future, and there are some proposals for an extensive modernization of about 20 units. Several units have been assigned to the Naval Reserve Force; several others are employed primarily in home-waters patrol duties. Builders: Bath Iron Works, Maine (lead); Todd SY, San Pedro, CA; Todd SY, Seattle, WA. Design: Designed as a low-cost, mass-produced ship. The ships have a helicopter deck and hangar at the stern, a boxy superstructure, and the Mk13 system forward. They are fitted with modern, but not top-of-the-line, systems, and thus are best suited for low-medium threat areas. They have been lengthened at the stern to accommodate the RAST system, allowing SH-60B operations. FFG 8 has only one operational hangar; the second has been converted for other uses. Modernization: Moderate upgrades are being undertaken as funds allow, but no major modernization is scheduled. Several units have the SYS-2 combat system, greatly enhancing their AAW capabilities. 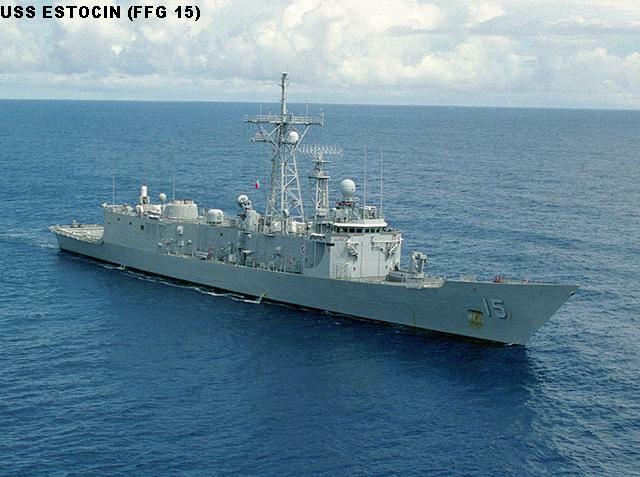 FFG 8, 28, 29, 32, 33 were originally "Short Hull" ships, but they have been retrofitted with RAST, becoming "Long Hull" ships. Concept/Program: These are the survivors of the early Perry class ships, which were not equipped with RAST and could not operate the SH-60B helicopters. Many of the "short hull" ships have been discarded, and the remaining few will be discarded by 2003. Many have been transferred to foreign navies. All of the survivors are operated by the Naval Reserve Force, employed in home-waters patrol duties. Design: Designed as a low-cost, mass-produced ship. The ships have a helicopter deck and hangar at the stern, a boxy superstructure, and the Mk13 system forward. They are fitted with modern, but not top-of-the-line, systems, and thus are best suited for low-medium threat areas. Some of these ships have one of the two helo hangars converted to other uses. Disposal Note: All Knox, Brooke, Garcia and Glover class frigates have been discarded; many have been transferred to foreign navies, and the others will be scrapped.